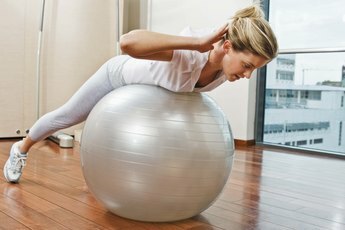 Toning balls are used in various exercises, including yoga. You've probably seen toning balls grouped together on the sporting goods shelf and passed them by without a second thought. After all, your trusty pair of hand weights gets the job done just fine. Toning balls have a lot more to offer than your old, hard hand weights, however. These versatile sand-filled balls conform easily to your hands with their soft, flexible vinyl coverings. Not only are they more comfy to hold, but you'll be impressed with the results of your toning ball workout too. You don't need a personal trainer to sculpt the perfect upper body. Grab one 4- to 8-pound toning ball and hit the deck for a modification on the traditional pushup. For these propped pushups using a toning ball, come down onto your hands and knees. Place your hands on the ball and press upward, extending your legs back. Coming onto your toes, making sure your torso and legs are in alignment. Now tighten your core and inhale, bending your elbows as you sink your chest toward the floor. Push up as you exhale. 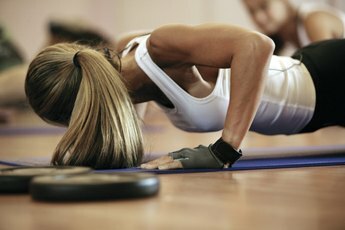 Repeat the pushup for a total of eight repetitions. Use your toning ball to get tight, toned thighs and glutes and say farewell to those bulky dumbbells for good. Walking lunges, with or without an added twist or an overhead press, and reverse ball throws all target the lower body. Moreover, as an added bonus, your shoulders will feel the burn too. To do a walking lunge with a twist, begin in a standing position. With your feet hip-width apart, tighten your stomach. Hold the toning ball with both hands, aligning it with your belly button. Step off with your right foot entering into a lunge. Once you're in the full lunge, twist your upper body to the left. Twist back to center, then stand. Immediately bring the opposite leg forward repeating the movement, except rotating in the opposite direction. Do this move for 10 repetitions. With a healthy diet and hard work, modelesque abs can be a reality without liposuction. While there's no such thing as spot reduction, reducing your fat intake, pumping up the cardio and adding a strength routine -- like a toning ball workout -- can flatten and chisel your abs. Toning ball workouts include standing and seated trunk rotation, standing wood chops, hay bailer's and toning ball pushups. Seated trunk rotations are an ideal beginner exercise that works yours sides and middle for an hourglass look. Begin by sitting on the floor and stretching your legs out in front of you. Next, bend your knees slightly and straighten your spine. Bring the ball to your chest, holding it tightly with both hands. Begin slowly rotating from left to right, stopping briefly in the middle as you switch sides. Remember to inhale and exhale throughout the exercise. Do 10 repetitions on each side. Add a toning ball to your usual yoga or Pilate's routine for more of a challenge. Standing yoga poses -- like the Chair and High Lunge -- are ideal because your arms are over your head, increasing your need for balance. Adding the ball to your Pilate's spinal twist ramps up the burn. Lie flat with the ball overhead. With your knees bent at 90 degrees, bring the ball to your thigh as your crunch up. While doing this, take your knees to the left. Return to the starting position and repeat on the opposite side.